The S.M.P. 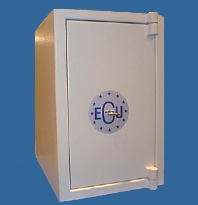 ECU 2 range has been produced with the Domestic market in mind, designed and manufactured to protect your important Documents, Jewellery, Valuables and Cash. The S.M.P. ECU 2 is manufactured in two convenient options – Vertical and Horizontal which will offer itself to most applications and fittings i.e. wardrobes, cupboards etc.. Both models will accomodate A4 sized files, with a standard fitment in both models of a Jewellery Tray, situated on the back of the door, for those smaller personal items such as necklace’s, cuff links, rings etc. The Body consists on a 3.6mm total inner and outer steel skins filled with 40mm of an anti penetration concrete barrier material. The Door consists of an overall protective thickness of 18.5mm which includes a 12.5mm outer steel plate, and is secured by Dual 16mm Locking Bolts which are thrown by a Double Throw Double Bitted high quality Keylock which once thrown gives full locking engagement with the Body. The Door aperture is fitted with an Intumescent seal, which in the unfortunate event of a fire, will seal and protect to a certain level, the contents of the unit. Pearl textured paint finish, which blends in well within most environments and decor’s. The Boltwork operates moving Bolts of 29mm diameter, with an extended throw of 25mm ensuring maximum engagement and security when locked. The fixed dog Bolts are also 29mm in diameter and secure the inner edge of the door to the body. 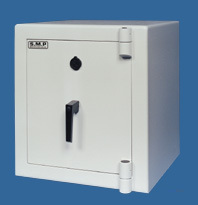 The Trend series provides a high level of security, available in 6 sizes, secured by key or digital lock (5 sizes). Cash rating £3,000 or valuables £30,000.